I found myself perusing the newspapers and magazines at my local supermarket recently. I’m always amazed when I check the front pages of some magazines. They seem to be obsessed with the state of celebrities’ marriages and the size of women’s waists. 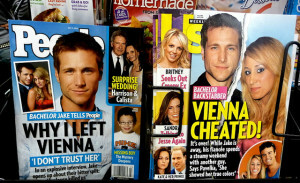 The reason that magazines publish this kind of material though is that we, their potential readers, have a great interest in celebrity gossip. Of course, it’s not just celebrity gossip. When I go to work, my colleagues are always keen to share the latest rumour surrounding someone we work with. Quite often, there is little basis of truth behind these stories. They’re often based on an overheard whisper, or a comment taken out of context. They’re not out and out lies, but such stories could best be described as half truths. It can be very easy to become a conduit for gossip. If we hear something potentially interesting about someone else, we can be quick to pass it on. As Christians we have a responsibility to rise above rumour and gossip. Jesus tells us that one of the most important commandments is to love our neighbour as ourselves. The apostle Paul, in his first letter to the Corinthians, helpfully tells us some of the characteristics of love. One is that love does not dishonour others. If we discuss the lives of others, without knowing the full truth behind any story, that is precisely what we are doing; we are dishonouring them. What is more, if we pass on a story that we know know to be untrue, we are guilty of slander. Jesus himself described slander as ‘evil’ and said it ‘defiles a person’. Let’s resolve this morning to steer clear of gossip and rumour. Let’s be sure that we do not dishonour another person with our words. And let’s ensure that we do not defile ourselves by slandering others. Instead, let’s aim to bring glory and honour to Christ with every word we speak. This entry was posted in Audio, Bible Reflections, Daily Reflection, Podcast and tagged 1 Corinthians. Bookmark the permalink.